JAMES DeGALE laughs as he thinks about the comparison. “He reminds me of Mickey from Rocky because he wears a hat sometimes in the gym and has that funny little look about him when he is barking orders,” he said.DeGale’s trainer, the former world title challenger Jim McDonnell, might remind the fighter of fictional coach Mickey Goldmill from the Rocky series. But their story is a real-life tale of how sticking together through the hard times can deliver rewards, with DeGale becoming world champion in 2015. They look to reach another high in New York on Saturday week when the IBF super-middleweight champion takes on WBC title holder Badou Jack in a unification clash. DeGale and McDonnell have been almost inseparable since they paired up in 2008 when the Harlesden fighter turned pro after winning Olympic middleweight gold in Beijing. They chat about boxing over cups of tea in McDonnell’s house even out of camp and have spent the last three weeks living with each other at DeGale’s because McDonnell’s family have been on holiday.“It is rare really because there are not many fighters and coaches that have got a bond like me and Jim,” said DeGale. “But he drives me mad, when I’m in camp he drives me mad. “Sometimes I have to go in my own room, have a couple of hours by myself, because Jim loves boxing and he is constantly talking about the fight or the next hard session we are going to do. It is a close-knit group, with DeGale’s mum Diane managing the training camp in Miami. Sister Eloise is also involved, while McDonnell’s son, Jimmy, helps out in the gym along with a strength and conditioning coach.“I’m spoiled and I get looked after by my mum and my sister, so when it is me and him (McDonnell), it is like the blind leading the blind,” DeGale said. “I have to look after him. I’ve always got to remind him of packing his bag, bringing his phone. McDonnell laughs and agrees that he has been spoiled, before DeGale continues to explain how he has to calm down his excitable trainer at times. “Jim has to be looked after,” DeGale said. “That was a bit scary,” McDonnell adds. But behind all the joking and hard work in the gym, there is a real bond between the pair that was put to the test when DeGale lost to bitter rival George Groves in 2011. “There was no need for me to leave Jim,” said the Londoner. “On that night, if there was anyone to blame it was me. I left it too late, I didn’t put enough in.”Apart from the Groves defeat, there were times when DeGale’s career seemed to be on the path to nowhere, fighting in shopping centres rather than the big arenas that his talent deserved, but the pair stuck together. 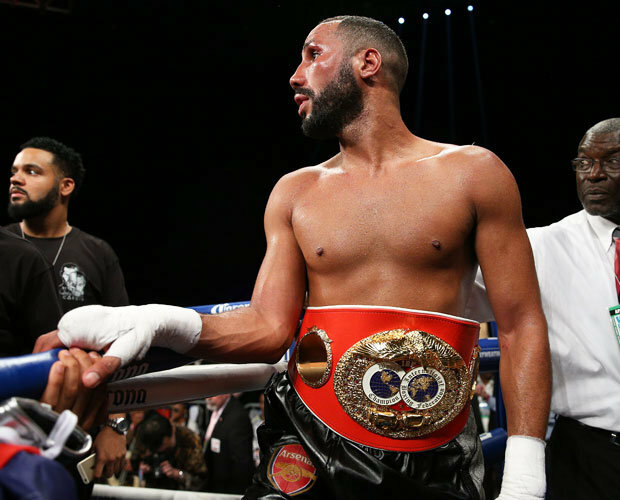 Their reward came in 2015 when DeGale became the first Brit to follow Olympic gold with a professional world title when he beat American Andre Dirrel on home turf in Boston. “It was like a release,” McDonnell said. “That night I think Jim won a world title as well, I felt I won it for him too,” said DeGale, pointing to McDonnell’s career in which he fell just short in two world title attempts to Brian Mitchell and Azumah Nelson at super-featherweight.